Taking care of my kids is a lot of work and I am sure I must burn a few calories constantly picking up after them, but at the end of the day I am zapped of all energy and am not kept in shape by being exhausted by them. Getting out and running and working out, is what helps me burn calories, keeps me energized and still helps me to fit in my clothes after 5 kids. I started running when I was around 20. I would run a few laps around my neighborhood and call it a day. Then I started going to a local park that had a mile loop. I started out really slow and slowly but surely made it a whole mile without stopping. I didn't love it right away. I learned a lot about perseverance and keeping my eye on the goal. Running did not come easy, but over time I have come to absolutely love running. Sometimes I just need a break from my kids, my house and all the noise and chaos. Running forces me to get out of the house, get some fresh air, quiet my soul and helps me to feel more prepared to face whatever the day holds. I don't have a lot of free time at my disposal. I only have a certain amount of time before my husband leaves for work that I can get out. Depending how fast I am going I can sometimes run out the door and get two miles in around my neighborhood in about 18 minutes or less. If I want to get more miles in I either wake up earlier or go when I know my husband doesn't have to be to work early. All you need to run is some good running shoes and workout clothes. I like to take my ishuffle or phone to track my pace and miles and listen to my favorite music. That is it. 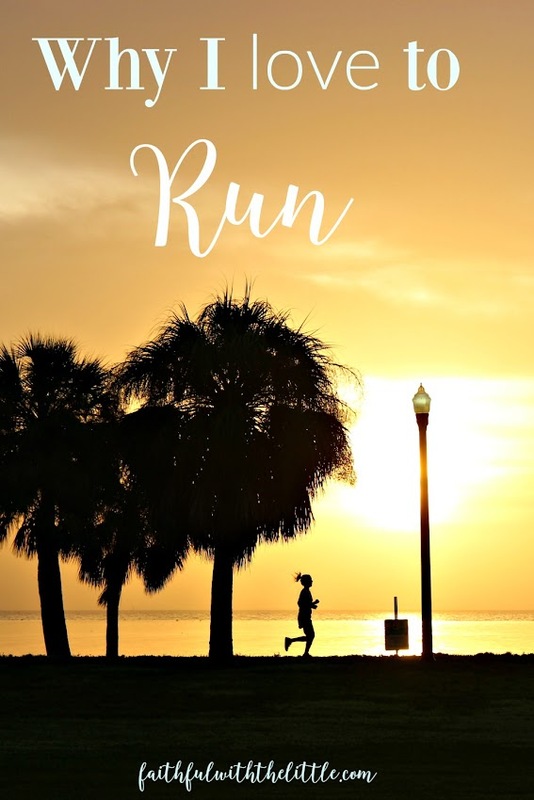 Though running shoes can be expensive, considering how many miles you can put into them and that you don't have to pay a fee to run outside; I would say running is comparatively free. Instead of feeling tired and drained after running, I feel the opposite. I come home energized to take on the day, motivated to do what lies before me and my mind and soul renewed. Ever since I started running, I pray as I run. I get easily distracted when I try to pray while sitting. My mind wanders and it's hard for me to focus. But when I am out running I somehow am able to tune into the Lord and not get distracted. I also love to listen to my favorite worship songs; worshipping the Lord as my legs run to the beat. I honestly get so pumped up and excited as I move to the music and sing the words in my heart; taking hold of God's promises and claiming them for the prayers and burdens on my heart. Running to music always helps me go faster than I normally would. I know everyone has different times that work best for them to exercise or run. For me it's in the morning before everyone is awake and even before the sun has risen. I am blessed to live in a peninsula within the peninsula of Florida. I can see the sun rising on one side of our city and then go see the sun set on the other side. My favorite place to run is downtown on the water. I try to time it so that I can see the sun rising as I am running. My breath is always taken away as I see the golden orb rise into the sky, spreading so many beautiful lights and colors through the clouds and sky. I usually have to stop, take a few pictures and take it all in. God always brings scriptures to my mind as I gaze on his glorious handiwork and meditate on his goodness. Of course you can stand in awe of God's creation without running, but it really is special when you are out running in it; becoming apart of it. I am always around my own people all day, so I personally prefer anytime that I can get alone by myself to just think... or not think. Like I said earlier I also love making running part of my time with the Lord. Just me and him. But I also really enjoy when I can run with a friend. It always goes by so fast and is a great time to catch up while getting some miles in. I am blessed to have some friends that run about the same pace as myself so it's not awkward. Otherwise it can be really uncomfortable to run with someone who is either faster or slower than you. The great thing about running is that you can do it at your own pace and go as far as you want. Not only is running a great way to lose weight and burn calories but it also builds your stamina and heart rate. I love being able to set goals for myself and go a little bit farther and a little bit faster each time. I have found that setting goals for myself has been a great motivation to helping stay fit. I have signed for many races over the years and there is nothing like having that goal in front of me to get me going further and faster than I normally would. I have taken part in many 5ks and a few 10ks and also a half marathon. I am still contemplating a full marathon. Someday I would like to do a sprint triathlon. In my season of life I am needed a lot at home, so right now I do what I can and am thankful for how often I am able to get out. Foremost my main goal is to seek Christ first and as I do that everything else will fall into it's rightful place...even running. I am so encouraged by you and your discipline to make time for exercise with 5 kids at home! Personally I LOVE running - for all of the reasons you mentioned above. I ran my first marathon 6 years ago and am still at it, though the way I run/train has changed drastically over the years. My "unofficial goal" is to run a marathon after each baby and training now as a momma has forced me to get more creative with workouts and to wake up early! I have two little boys and I know running helps to clear my mind and calm my soul. It is my favorite quiet time. I totally admire you being a running mom of 5! Thanks Amy! But I think no matter how many kids you have it can be just as much of a challenge. They are a big part of the reason I do run. I need time away from them;) That is so awesome that you have set that goal for yourself. After I did my first half marathon I didn't think I ever wanted to do a marathon. But we will see. I find it's so good for me to have goals and something to look forward to. You are so inspiring to me and I am looking forward to following your journey! I am with you. I love running and agree with all of your reasons here! I enjoy running alone, but also love the community it can give. I competed in track and cross-country and loved running with my teammates. My husband and I started dating after we started running together. Running flies by when spending the time with others! Congratulations on the new baby!! I am so happy for you. Being pregnant is a whole nother ball game when running. I totally slow down when I am pregnant and feel like I have to force myself to run. We'll see about the marathon. Yeah, it would definitely have to be the right time.